Garza Blanca Preserve was delighted to host Eva Longoria’s birthday getaway with friends and family as the American television and film actress celebrated her 39th birthday in Puerto Vallarta. Basking in the resort’s Grand Penthouse, the Desperate Housewife star returned once again to Garza Blanca, this time joined by a large party of friends and family for a Mexican mini-break to celebrate her belated birthday as well as the engagement of two of her close friends. The luxury vacation was the second time Longoria has stayed at Garza Blanca, being that she loves the property and staff so much. To fully mark her birthday with a bang, the resort arranged a fabulous firework display on Banderas Bay which Longoria and her guests enjoyed from the balcony of the 12th floor penthouse after Garza Blanca’s chef had prepared a private dinner for the party in the luxury residence. In just four days the fun loving group spent their time lounging on the beach and indulging in the tranquility of the resort’s Hamara Spa as well as enjoying a fishing trip and hiking tour around the preserve’s grounds. Longoria also tweeted that she “had the most amazing time at @garzablancapvr! 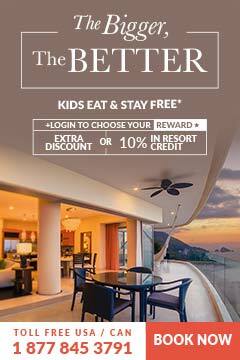 Can’t wait to be back again.” And here at Garza Blanca there’s no doubt that we can’t wait for her to return. Next PostWeddings – A Perfect Excuse for a Party!